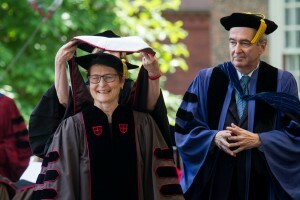 Jean Howard, George Delacorte Professor in the Humanities at Columbia University, co-director of CSSD’s Women Mobilizing Memory working group, and former director of CSSD, was awarded an honorary doctorate by Brown University. A teacher, scholar, and Shakespeare expert, Howard received her B.A. from Brown and served as a member of Brown’s Board of Trustees from 1974 to 1981, leading the Committee on the Status of Women, and was chair of the Advisory Council on Diversity. She currently chairs the Associate Council of the Pembroke Center for Teaching and Research on Women, also at Brown. Photo courtesy of Nick Dentamaro/Brown University.